The Manila Observatory is a private non-stock, non-profit, scientific research institution established in 1865 by the Jesuit mission in the Philippines. With Federico Faura at its inception, it was engaged in the systematic observation of Philippine weather. It began serving typhoon warnings in 1879, and embarked on earthquake observations in 1880. In 1884, The Spanish government issued a royal decree formally recognizing the Manila Observatory as the official Philippine institution for weather forecasting. The years after saw the Observatory branching off into other areas of scientific research and service. In 1885, the Observatory began its time service that greatly benefited merchant shipping. A seismology section was established in 1887. In 1899, the Observatory ventured into astronomical studies. The American colonial government recognized the importance of the Observatory’s work, and, in 1901, established it as the Philippine Weather Bureau. For about 45 years, the Observatory remained active and famous in international expositions and scientific expeditions. The Institution continued to be well known for its accurate typhoon forecasts and scientific works in the field of meteorology, geo-magnetism, and astronomy. The Second World War brought almost irreparable damage to the Institution. During the battle of Manila Bay, the Observatory, with all its valuable instruments and scientific documents, was completely destroyed. After the war, the Observatory ceased to function as the Weather Bureau since a distinct government agency was established for this purpose. It was only in 1951 that the Observatory was able to resume its post-war operations. It opened in Baguio, where it initially confined its research to seismology and the study of the ionosphere. 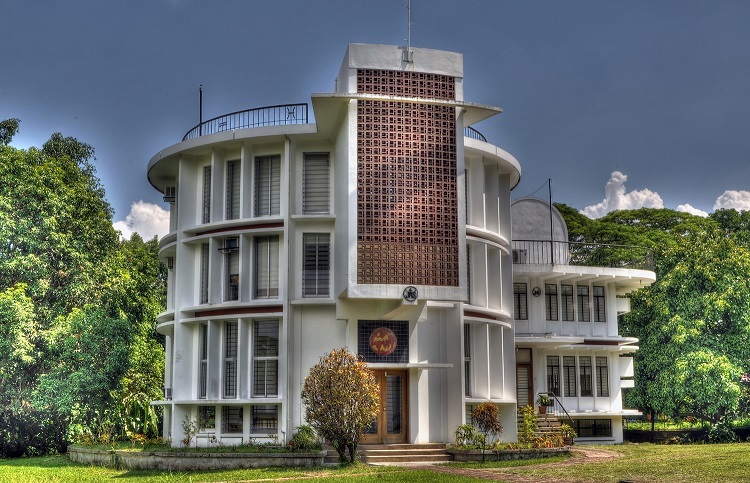 In 1963, the Manila Observatory transferred to the Loyola Heights campus of the Ateneo de Manila University, where it continued its seismic, geomagnetic, and radio physics research, while expanding into solar physics as well. At the turn of the 21st century, the Observatory finds itself at the nexus of global concerns for environment and development. With its tradition of excellence and service in scientific research, the Observatory envisions itself as a vital partner in these critically global yet locally relevant concerns. Through its present research programs, the Observatory now actively confronts these new challenges through a science that must inform and guide the shaping of a safe and sustainable future for humankind.